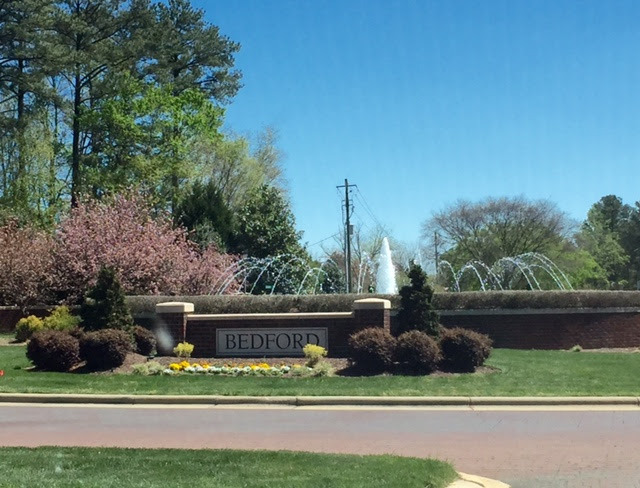 The first time I drove through Bedford, I remember saying it should have been called “Stepford.” You remember the movie “Stepford Wives” about the robotic women-where everything was perfect all the time? LITERALLY, there were children rolling down a grassy hill laughing while SAHMs in their yoga pants (similar to the ones I had on today) watched from the park bench. Then, there was a family of 4 riding their bikes together, helmets perfectly in place, everyone smiling. Of course, as we drove through the community we also passed numerous neighbors out and about walking their adorable dogs, and carrying bags to use to clean up “just in case.” I’m telling you, it was perfection. I think this is exactly the scene the Wakefield Development Company had in mind when they curated the neighborhood back in early 2000s. 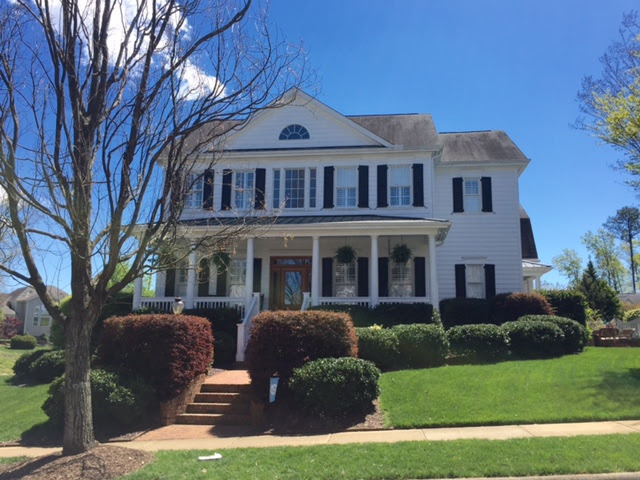 Bedford is a community designed after the classic movie “It’s a Wonderful Life.” The homes are purposefully situated very close together, with very small homesites, but tons of large open spaces throughout the neighborhood to encourage neighbors to gather together. 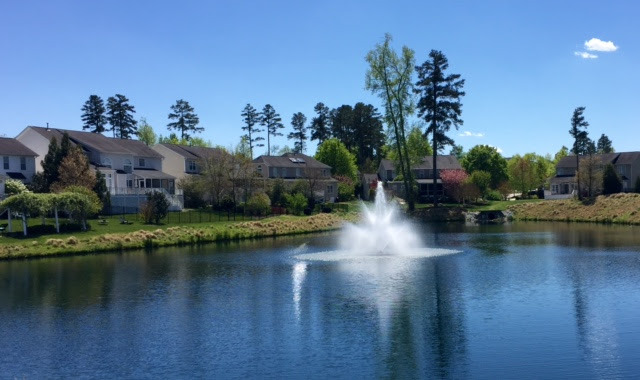 There are several ponds with homes overlooking them, and numerous islands/medians/courtyards with benches and flawless landscaping. I felt like Oprah made a stop as the first families were buying and said “YOU get a park on your street!” “YOU get a park on your street!” “YOU get a park on your street!” They. Are. On. Every. Corner. Wish we had that in our neighborhood so the kids could safely walk to the corner to play (and of course, both sides of the streets have sidewalks!) 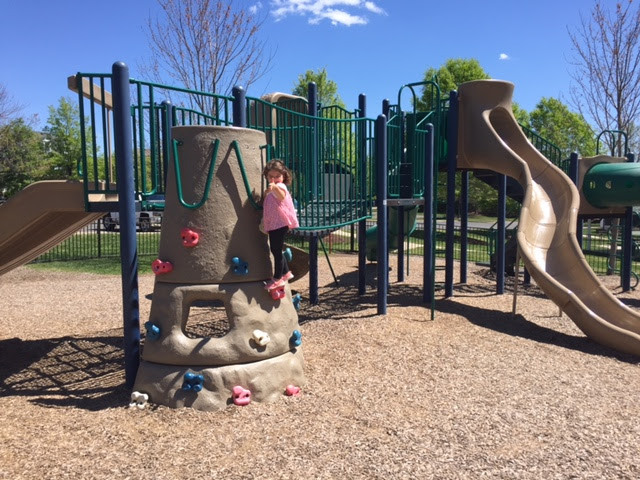 Harper loved testing out 3 of the different parks and gave the equipment the thumbs up. Year round, there are social events at the clubhouse for those who wish to attend…bunco, wine night, casino night, etc. 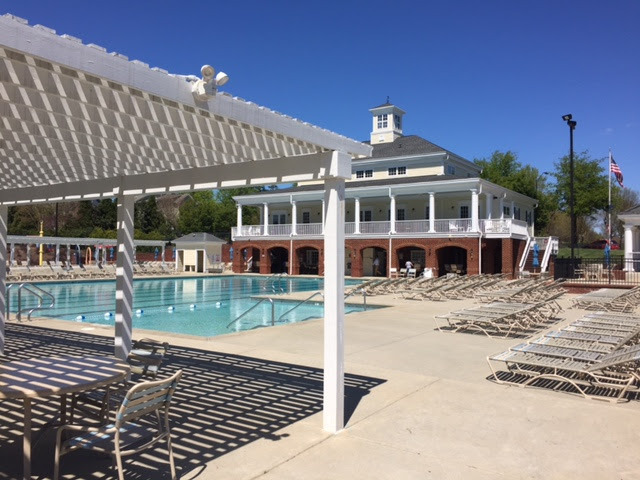 Behind the clubhouse, the pool is busy with swimmers, sunbathers, and families gathering to hang out. There are also tennis courts there and, of course, a large park for the children to play. The homes range in price from the $150’s to over $1million. 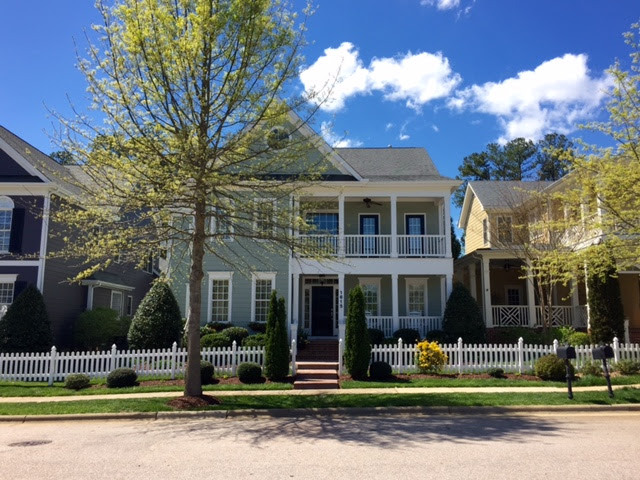 There are townhomes, traditional style single family homes, bungalows, Charleston-style homes, and estate homes. 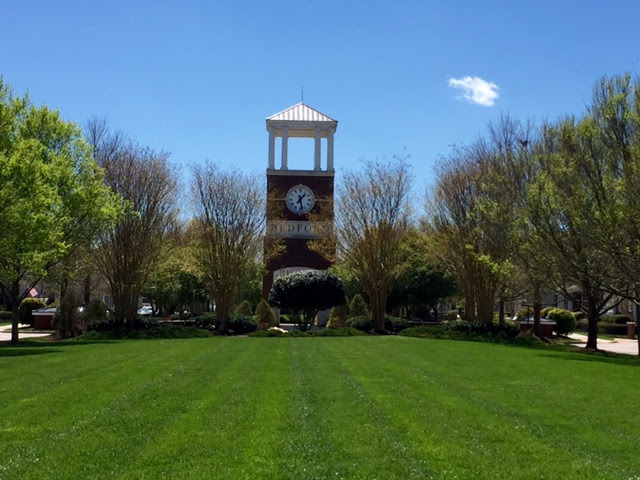 In the center of the community is a “town square” with a clocktower. I remember attending a Christmas in July type event in 2007 when the HOA brought in a snow machine and filled the clocktower yard with snow so all the kids could go sledding…so fun! Townhomes line both sides of the clocktower, and at the end of that street Bedford has its own commercial section. Everything you could ever want is there-restaurants, dry cleaner, day care, you name it. You can even stroll home from the bar at night without ever worrying about calling an uber! So, WHAT’S NOT TO LOVE? Well, the traffic is a little annoying. If you work a 9-5 in RTP you’re going to sit in quite a bit of traffic on Falls of the Neuse getting to I540 (and then of course the traffic of 540 and 40 but that’s coming from almost anywhere in town.) Also, anti-socials beware…this neighborhood was designed to bring neighbors together, not give you your personal space. If you’re like me you’ll be at every Bunco night, Wine Club and pool party that there is. If, however, you’re looking for privacy, lots of land or to have a birthday party for your child that doesn’t include 75 of their closest friends (ie neighbors) this may not be the place for you!